Three More Words Archives - Joelle Delbourgo Associates, Inc. In the sequel to the New York Times bestselling memoir Three Little Words (Atheneum/Simon & Schuster, 2008), Ashley Rhodes-Courter expands on life beyond the foster care system, the joys and heartbreak with the family she’s created, and her efforts to make peace with her past. Ashley Rhodes-Courter spent a harrowing nine years of her life in fourteen different foster homes. Her memoir, Three Little Words, captivated audiences everywhere and went on to become a New York Times bestseller. Now, in Three More Words (Atheneum/Simon & Schuster 2015/paperback 2016), Ashley reveals the nuances of life after foster care: College and its assorted hijinks, including meeting “the one.” Marriage, which began with a beautiful wedding on a boat that was almost hijacked (literally) by some biological family members. Having kids—from fostering children and the heartbreak of watching them return to destructive environments, to the miraculous joy of blending biological and adopted offspring. Whether she’s overcoming self-image issues, responding to calls asking for her to run for Senate, or dealing with continuing drama from her biological family, Ashley Rhodes-Courter never fails to impress or inspire with her authentic voice and uplifting message of hope. 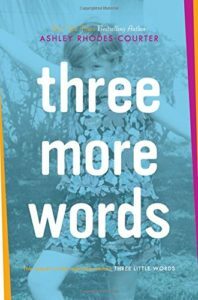 In her undeniably hon est and inspiring memoir Three Little Words, we were captivated by Ashley Rhodes-Courter, an amazing young woman who—through nine years, forty-four caseworkers, and fourteen foster homes—“not only survived, she thrived” (Teen People). Since then Rhodes-Courter has become an international advocate for adoption and child welfare. She has been interviewed by Diane Sawyer and spoken on Capitol Hill. She was called upon to run for Florida State Senate. She became a foster and adoptive parent, helping children just like herself. And she has begun to come to terms with her past. THREE MORE WORDS tells the riveting story of how the foster kid who refused to slip through the cracks has begun to change the world. THREE MORE WORDS also reveals the nuances of life after foster care, including college, marriage (which began with a beautiful wedding on a boat that was almost hijacked—literally—by some biological family members) and having kids, from fostering children and the heartbreak of watching them return to destructive environments, to the miraculous joy of blending biological and adopted offspring. Sequel to Ashley Rhodes-Courter’s THREE LITTLE WORDS sold! That grew into a memoir about growing up in the foster system. Published by Atheneum, a division of Simon & Schuster’s Children’s Publishing, Three Little Words went on to sell over 120,000 copies, hitting The New York Times bestseller list. Ashley, who since her teens, has been speaking out about the rights of children, especially in foster care and adoption situations, crisscrossed the country, addressing audiences as diverse as those who work in the justice system to schools and parent and teen groups. The book was optioned for film, and as I write, director James Mangold (Girl Interrupted, Walk the Line) is collaborating with actress Reese Witherspoon in a feature film that should be released in the fall of 2014. Ashley is now 27, married, with a biological son. Together with her husband, she has already fostered many children, trying to apply the lessons learned as a foster kid to parenting. She has won scores of honors and awards for her inspiring work, graduated college with two majors and two minors, and finished a Master’s degree, all while juggling the life of a newlywed, learning to parent, and a whirlwind public speaking schedule. I was thrilled when Ashley sent me a proposal for the sequel to Three Little Words, and even more thrilled when her publisher, Atheneum, picked up the publishing rights. Three More Words continues Ashley’s story into early adulthood. She will share stories of joy and heartbreak as she learns to live with the families she belongs to—the one she was born into and her adoptive family—and as she forges the bonds of a family of her own. Most of all, she embraces the “three more words” that she now feels comfortable uttering: “I love you.” Three More Words continues the journey but also the biggest lesson of all, learning to give and receive love. Thanks to a fantastic editor, Caitlyn Dlouhy, and the dream team at Atheneum. 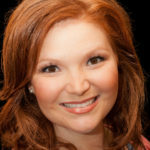 Ashley Rhodes-Courter is an advocate for adoption. She has delivered speeches on Capitol Hill and given keynote addresses at conferences about adoption and foster care. She has been featured in The New York Times, USA TODAY, and Glamour, as well as on Good Morning America, Nightline, Today, CNN and more. Her first memoir, THREE LITTLE WORDS (Atheneum Books for Young Readers), began as an essay, which won a writing contest for high school students, and was published in The New York Times Magazine. A graduate of Eckerd College and a champion for the reformation of the foster care system, Ashley speaks internationally on foster care and adoption. Visit her at Rhodes-Courter.com. Ashley’s is the quintessential American success story. Born in 1985 to a single teen mother, by the age of 3 she was in Florida’s foster care system where she spent almost ten years being shuttled between 14 homes—some quite abusive—before being adopted from a Children’s Home at the age of twelve. Despite her ordeal, she excelled in school because she believed that, “my education was the one thing nobody could take from me.” Early in her life she felt compelled to advocate for herself and the other children she lived with, particularly in the abusive foster homes. Her efforts and academic achievements landed her Eckerd College’s Trustee Scholarship—the school’s most prestigious full-tuition award. She graduated with honors and ahead of schedule earning a double major in Communications and Theater and a double minor in Political Science and Psychology. She went on to earn a Master’s Degree in Social Work from the University of Southern California. During her undergraduate studies, she was one of 20 college students selected for the USA Today All-USA Academic Team and was named one of GLAMOUR Magazine’s Top Ten College Women. She was also named one of the four Golden BR!CK Award winners for outstanding advocacy for community change by Do Something. As part of their campaign, she was featured on 25 million bags of Cool Ranch Doritos. She was the Youth Advocate of the Year for the North American Council on Adoptable Children, has received the Kids to Kids National Service Award from the Child Welfare League of America, and was the recipient of two Angels in Adoption Awards from the Congressional Coalition on Adoption. On June 1, 2003, the New York Times Magazine published her grand prize winning essay about her adoption day. She expanded her essay into a memoir, Three Little Words, which was published by Simon & Schuster in January 2008 and quickly became a national bestseller. The book has been adopted by schools and communities as part of One School, One Book initiatives across the country. Ashley currently serves as a National Child Welfare Ambassador for the American Humane Association as well as on several national and international boards including, OrphanAid Africa, Ghana; Children Without a Voice USA; and Family Focus Adoption, USA. Recognizing that child welfare issues are universal, Ashley spent time in Europe, South Africa, and China studying child welfare and social policies. Locally, she serves on the board of the Pasco/Pinellas Heart Gallery, PEHMS (Personal Enrichment Mental Health Services), and consults with many local and international agencies and groups that work in the mental health, human rights, education, and child welfare fields. She has also been a volunteer Guardian ad Litem (or CASA) and is a licensed and active foster parent, as well as biological mother to two children. Since the age of 14, Ashley has advocated for the half-million children still in foster care in America by giving speeches throughout the U.S. She has spoken on Capitol Hill, has been invited to the White House, and has taught at numerous colleges and conferences for elected officials, judges, social workers, policy makers, and families. Internationally recognized, Ashley has been featured on The Today Show, Good Morning America, Nightline, Nancy Grace, ABC Primetime, Montel Williams, and other national media outlets. She frequently appears in local television and newspaper markets when she travels for her speeches. She hosted a television program called “Explore Adoption” which was produced by the State of Florida to raise the public’s awareness of foster children in need of loving and permanent homes. This segment won an Emmy in 2009. Three Little Words, published in 2014 in the UK (Ebury/Random House) was an instant London Times bestseller. At the age of 26, Ashley ran a very close race for the Florida State Senate. Ashley has turned her pain into power and has a passion to share her story with those who have experienced adversity. Ashley strives to encourage education, compassion, community involvement, and positive outcomes for youth and families. 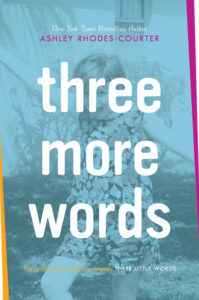 In late June, 2015, Atheneum released the long-awaited sequel to Ashley’s first memoir, THREE MORE WORDS, in which she details her life as an adult: her marriage to her long-time boyfriend, her sometimes stormy relationship with her biological mother, becoming a biological mother herself to two children, and a foster mother to many. Her efforts to initiate change to better the lives of foster and adopted children continues, and the stories she tells of her interactions with some of these children are at times poignant, humorous and heartbreaking.